There are a few misconceptions about chiropractic still floating around. After 20 years of practicing as a chiropractor in downtown Ottawa, I’ve heard my share of them. For this reason a large part of my focus when meeting new patients is to empower them with the understanding of how their body works, the why behind chiropractic, what they can expect when under care, and what I expect from them as we partner together to optimize their health. Let’s look at some of these misconceptions you may have heard about chiropractic and I’ll shed some light on them by sharing facts and perspectives based on over two decades of experience. Misconception #1: Chiropractors are not properly trained and regulated. Chiropractors receive extensive training. The Doctor of Chiropractic degree must match the educational rigor and standard of any doctoral degree. I studied full-time for 8 years including the time it took for my Bachelor’s degree and Doctor of Chiropractic degree from Parker College of Chiropractic in Dallas, TX. If you are interested in the details of the academic requirements, you can see them here. Further to completing all of the academic requirements, all Doctors of Chiropractic must pass rigorous examinations prior to becoming licensed to practice. In Ontario, Canada, the College of Chiropractors of Ontario is the governing body that regulates the profession in Ontario. As stated in their website: To ensure the public interest is protected, regulated health care providers in Ontario must obtain licences or certificates of registration to practise their profession. The College of Chiropractors of Ontario (CCO) is the governing body established by the provincial government to regulate chiropractors in Ontario. Every chiropractor practising in Ontario must be a registered member of CCO. Misconception #2: If chiropractic doesn’t correct your problem within 2 to 3 weeks, it won’t work for you. Although relief may be felt after the first adjustment or even within the first few days or weeks of care, most spinal problems have far deeper roots and have taken years to develop. Such health issues will realistically require more time to begin feeling better and to correct. Modern society has conditioned us to be so entitled to convenience that many people consider themselves too busy to consistently take care of their health. The universal laws of body physiology don’t care how inconvenient they are or how busy you may be. They still apply to you! This is why I give care recommendations for spinal corrective care that honors the reality that the adaptive process of restoring the body to optimal function requires consistent care over time. There are no shortcuts or quick fixes. Misconception #3: Getting adjusted is uncomfortable or even painful. Just to be clear, it would be unrealistic to say that every adjustment feels great, especially when working on patients with either acute injuries or long term chronic stiffness. In addition, pain and discomfort is subjective. 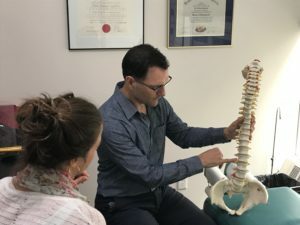 Like most chiropractors, I have patients who have come to me with the severe pain sensitivity that comes with fibromyalgia, so for these and other sensitive patients I use any one of a variety of adjusting techniques I’ve been trained on to best suit their needs. These techniques can be safely used with wonderful results on the newest of newborns (including my two boys when they were born) to the oldest of seniors. I hope I’ve been able to put some of your fears and misconceptions to rest. If you have any questions and are located in the Ottawa area, please do not hesitate to contact my clinic and schedule a free initial consultation where I would be happy to address your concerns.